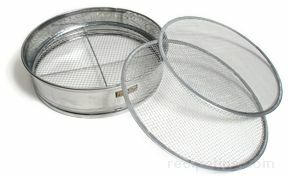 A wide, round, low-walled type of kitchen Sieve used to strain liquids or to sift and strain dry ingredients, such as flour, powdered sugar and nuts. This utensil typically has a round, shallow, ring frame with an attached mesh bottom. The mesh may be made from cheesecloth, nylon or steel. Steel mesh materials can be stainless or tinned steel that are made with a fine, medium and coarse-weaved screening stretched across a cylinder-shaped frame, similiar to the head of a drum, hence the name. Available in a variety of sizes, the Drum Sieve may be constructed of stainless steel, tinned steel, aluminum, or a native wood, which is the material most often used to make Asian Drum Sieves. The fine mesh of the Drum Sieve is commonly used to create smooth sauces requiring a texture that is consistently even throughout the entire mixture. Apples, tomatoes and other fruits and vegetables can be strained through the mesh to create clear and consistent juices or purées. Nuts can be pressed through the steel mesh to create powdered textures such as for flour. If cheesecloth is the material used for the mesh, the foods being strained may be juices or meats, fish and vegetable stocks needing to have a consistency that can only be obtained by using a very fine mesh. With a diameter of approximately 12 inches, the Drum Sieve enables food to be prepared by spreading it out over the surface of the sieve and working it by hand with a spoon or metal utensil to accomplish the straining, sifting or pulverizing of foods. Some Drum Sieves consist of only the individual Sieve while other models may contain two drum heads, one with the sieve that lays on top of the second Drum Sieve. Clamps are built into the sides of the multi-layerd Drum Sieve so if two heads are used, they can be locked securely into place with the clamps. 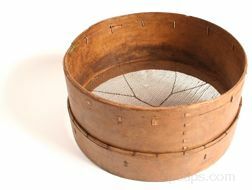 A Drum Sieve may also be referred to as a tamis or a Mouli Drum Sieve.